If a plague epidemic itself wasn’t enough, add in spontaneous combustion, and you’ve got yourself a hell of a time. Need a way to realize that the summer heat isn’t so bad? The following book review is SPOILER-FREE. 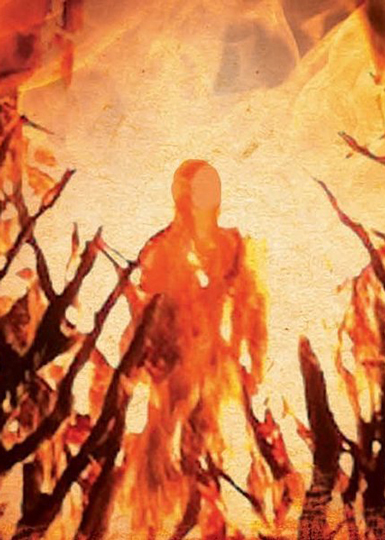 Joe Hill’s newest novel The Fireman follows Harper, a school nurse, from the beginning and on through a worldwide epidemic of Dragonscale, a disease that paints gold on the skin and will set the victims ablaze. As Harper carries on helping the infected, she learns more about the people who surround her. Almost simultaneously, Harper discovers that she is pregnant and has also caught Dragonscale. To add to the fear of suddenly catching fire, healthy people have begun to hunt down the infected to stop the spread of the ‘scale. One thing I absolutely loved about this novel was the writing. I have previously read Joe Hill’s Horns and the Locke & Key graphic novels, so I already was a fan, but his writing in this book was absolutely beautiful. In addition to vividly-described scenery and intense descriptions of action-packed scenes, Hill masters the ability to capture the reader into the emotions of the characters throughout the entire novel. There are so many strong feelings over the course of the entire book, and I laughed and cried and it was all so genuinely felt. Harper as a character is excellent, and is a great example of how a character can grow into a stronger person yet still stay herself. Though a bit more timid at the beginning of the book, Harper learns to stand up for herself and becomes a stronger person both mentally and physically. She never uses being pregnant as an excuse to get out of doing something, as she is always right where help is needed, and she also doesn’t let others tell her what she can and cannot do. Hill did an amazing job at writing from a female’s perspective, as it all seemed authentic and didn’t ascribe to any stereotypes. Each chapter held answers to previous questions that I had, but then brought up even more questions, which was great for reading in one sitting and also wondering about while I wasn’t reading it. There were characters I loved and others that I absolutely despised, and I enjoyed all of the nods to children’s literature, Stephen King’s novels and Fahrenheit 451 that were sprinkled throughout the book. By the time I had gotten to the middle of the book, I realized that the disease wasn’t the truly scary part, but rather the monsters it had revealed in the paranoid uninfected. In the end, I was left with so many different emotions, and I was not disappointed at all with any aspect of this book. If you haven’t picked up a Joe Hill book yet, start with this one, and if you have, read this one and be prepared to be blown away yet again. Have you read ‘The Fireman’ yet? Already a fan of Joe Hill? Chat with me about books on Twitter @Aprilms15, and be sure to follow us @YouNerded. Note: This book was sent to me by William Morrow Publishers in exchange for an honest review and feature on my Instagram.